A wilderness of rich lowland rainforests, coastal reefs and starkly beautiful volcanic islands awaits you at Ujung Kulon National Park - a UNESCO World Heritage Site located on the southwestern tip of Java.The park's lowland rain forest is the last stronghold for the Javan rhinocerous and a haven for primates: Javan gibbons, Javan leaf-eating monkeys, silvered leaf monkeys and crab-eating macaques all thrive here. Ujung Kulon Ecotourism promotes the concept of conserving the environment around you and preserving the natural resources and forest life. Eco Tourism in ujung Kulon takes you on a trip to the virginal land close to the Mother Nature but always remember not to cause any harm to the cycle of nature. Eco Tourism in Ujung Kulon is about taking a break from the fast city life and leading a slow paced life in the midst of the greenery. Wake up to the alarm of the chirping birds, eat healthy and hygienic organic meal, entertain yourself by watching the activities of the animals and birds. Explore the nearby village, learn about their customs and traditions, appreciate their art and craft and become friend with them. This is how you spend your days while on eco tourism in Ujung Kulon. In the remote south west of Java, the national park of Ujung Kulon is the site of one of Indonesia’s most pristine and untouched natural attractions. It is no coincidence that Ujung Kulon is classified as one of Indonesia’s World Heritage Sites and has been a natural reserve since 1937. The Ujung Kulon area offers various different landscapes, from the Gunung Payung massif in the southwest and the low rolling hills of the Telanca Plateau in the northeast, to the swamp area characteristic for the lower lying isthmus. Inventories of the Ujung Kulon wild life are the subject of numerous books. The fauna on the peninsula and the islands is almost too extensive to describe in short. The Javan rhino, a highly endangered species, together with leopards, Javan gibbons, banteng, eagles, pythons, crocodiles and turtles represents just a fraction of the wide range of carnivores, deer, primates, birds, reptiles and amphibians present. Ujung Kulon National Park is one of the last remaining natural forest on Java and one of very few areas offering a profile of sea-shore to mountain top tropical vegetation. 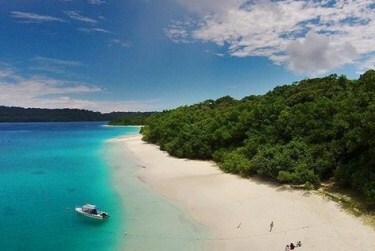 the beautiful isolated beaches that cover the coastline are among Ujung Kulon’s best-kept secrets. The snorkeling is spectacular to see the variety of tropical fish with clear blue cristal water. The park holds well over 700 species of plant life of which at 57 are classified as rare in Java Island and perhaps the world. Ujung Kulon National Park has a vast array wildlife, quite a member of which are endangered or rare. Some of animals are so unafraid that freely wander in and around the tourist lodges, others are sighted almost every days, many are heard rather than seen and same core rarely seen. The park has a wide variety of marine habitats. The rocky shores, mangrove swamps, mud flats, sea grass beds, coral reefs and sea trenches, providing diverse and fascinating insights into the underwater world. 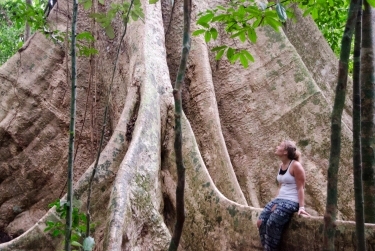 Ujung Kulon Ecotourism aims to work within all travellers budgets. We can adjust the itinerary and tour schedule to fit your budget. We can offer alternative transport or accommodation options according to what you can afford. Prices are also flexible according to the size of your group. We employ our guides locally. All are fully licensed, highly experienced and English speaking. Local weather conditions or the general unpredictability of Indonesia may necessitate adjustments to the tour itinerary or route. We fully trust our guides to make balanced and reasoned decisions to ensure your safety and enjoyment. 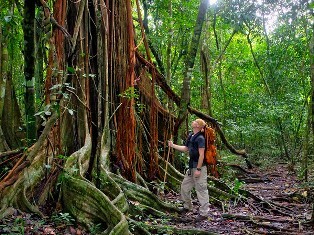 Some of our guides are also involved with research and conservation projects based in the area and are fully aware of the importance of following conservation guidelines, both to protect the jungle and the wildlife indigenous to this region and also to set an example to other guides and visitors.